four of London's finest heavy/ psych/ stoner underground bands. Headlining the evening, GNOB continue to gain followers and build on their momentum with each gig. Check out the top to bottom awesome LP: 'Electric Dream Demon' if you haven't already! Who better then Jackknife Seizure to fill the Wychhound shaped hole in our event . Fresh from performing at Mammothfest we are prepared to have our minds cracked in half by this awesome band. 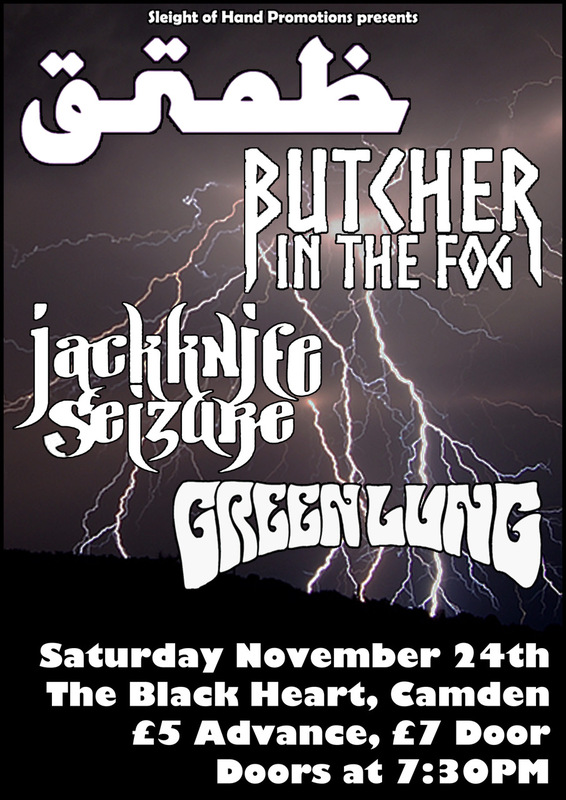 No strangers to the live scene and after a year long scheduling conflict we finally get to host Green Lung! Green Lung combine crushing heaviness with soaring hooks, summoning up the proto-metal spectres of Black Sabbath and Pentagram, the psychedelic heft of heavy prog and the anthemic gloom of Danzig and Type O Negative; all the while dragging those influences into the 21st Century and sculpting them into a sound that is entirely their own. Hailing from South London and made up of vocalist Tom Templar, guitarist Scott Masson, bassist Andrew Cave and drummer Matt Wiseman, the band released their debut EP Free the Witch in February 2018 and quickly gained the attention of cult label Kozmik Artifactz, who will be releasing their debut album in 2019.